Phyllida Barlow is 70. I mention it immediately because it is the most impressive thing about her. The art world has recently developed a taste for older women, particularly the forgotten ones who slaved away for decades in an obscurity they did not deserve. The new attitude has led to some welcome reassessments. Top of my list would be the remarkable Maria Lassnig, who, at the age of 94, is still staring us down with her fierce and naked self-portraits. But Barlow, whose career has taken off as abruptly as a rock dispatched by a trebuchet, is another good example. For four decades, she taught sculpture at assorted British art schools, from Chelsea to the Slade. Or, to put it another way, she disappeared. According to Barlow’s many notable pupils — Rachel Whiteread, Bill Woodrow, Tacita Dean — her teaching was always inspirational. But it was only when she retired from teaching, in 2009, that her own brusque and bulky sculpture was finally able to elbow its way onto the art circuit. These days, her outpourings are often before us, and her life story has acquired a mythic heft. So mythic that she has now been let loose on those huge cathedrals of space that run down the middle of Tate Britain — the Duveen Galleries. The Duveen Galleries are probably the most imposing art spaces in Britain. Tate Britain’s annual attempt to conquer these enormous cliff faces with contemporary art — in an initiative called the Tate Britain Commission — has hardly ever been successful. Last time out, a feeble video work by Simon Starling skulked nervously at the end of a corridor, like a spotty teenager at a party who refuses to leave the kitchen. Barlow’s effort is better. 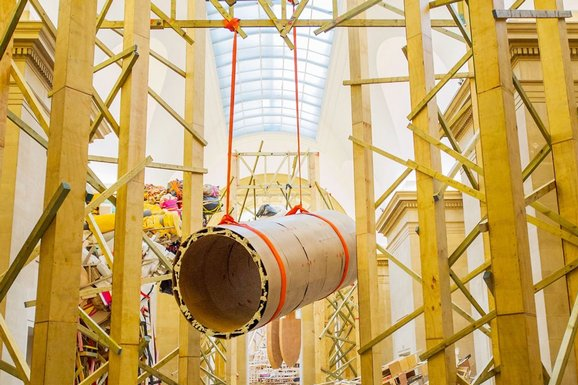 Her gigantic installation, called Dock 2014, fills the entire length of the Duveen Galleries, and climbs most of the way to their top, as well. Inspired by the scale and appearance of an industrial dock, the huge eruptions of scaffolding tower over you like a quayside full of rusty cranes. The first sculpture feels as if it is swinging containers over your head and onto a boat. The second has finished its lifting and created a ziggurat of brightly coloured boxes that rise up in the central galleries like the handiwork of some post-industrial Aztecs. All this has been assembled out of Barlow’s trademark combination of grubby industrial tarpaulins and haphazardly banged-together four-by-twos. If you live anywhere near her, you should probably padlock your skip at night: judging by this spectacular haul of inglorious materials, she spends most of her evenings prowling through building sites. Dock cannot be faulted for effort or ambition. The fearlessness of its attack on the huge emptiness of the Duveen Galleries is the most impressive thing about it. Every one of the half-dozen pieces that make up the installation aims for a big sculptural effect. Where the first whopper evokes the sensation of having heavy containers swinging above your head, the later ones approximate to the state of a collapsing wall, or a discarded heap of materials on a quayside. Although the riverside position of Tate Britain gives Dock a specific geographic history to evoke, there is no sense of a poetic connection with the past, no emotional evocation of London’s ruined waterside or any atmosphere of entropy. The huge battle of dock effects remains strictly instructional, like a humongous episode of Blue Peter in which the different impact of weights and balances in space is being illustrated with some old loo rolls and a box of toothpicks borrowed from a giant. And that’s the trouble with all this: it’s so damn art school. These are the drab, grubby, effortful, paint-splattered art-class aesthetics of the 1970s. I didn’t like them the first time round. Much more distressing is the news that visitor numbers at Tate Britain fell by a massive 10% in 2013. Ouch. More people paid to see the monkeys at Chester Zoo last year than chose to celebrate Britain’s artistic past, free. While part of me welcomes the increased quietude visited upon Millbank, because looking at art in peace is always better than glimpsing it through a crowd, another part finds the drop in visitors distressing. What has gone wrong? Is there a more important museum in any nation than the one charged with characterising and tracking the national identity? Tate Britain’s obvious problem is that it no longer connects with its audience. For some time now, the gallery has appeared keener to be viewed as an outpost of Tate Modern than as a treasury of the nation’s character. The present director, Penelope Curtis, has been a disaster. I first noticed what an appalling exhibition-maker she was when she co-curated the Modern British Sculpture show at the Royal Academy in 2011. You would have thought that telling the story of British sculpture in the 20th century was a simple enough task. Line it all up in the right order and who could fail to be impressed? Instead, we were treated to a jumble of themes and epochs lurching this way and that in a useless game of snap across the ages. It was, quite simply, one of the worst exhibitions I have ever seen. Subsequent shows at Tate Britain have continued the trend. One perfectly good exhibition idea after another has been ruined by the shovelling into the mix of forkloads of contemporary art, seemingly at random. How else to explain the abrupt popping up of the Chapman brothers in an exhibition devoted to the sickening and violent history of iconoclasm in Britain? At Tate Britain, you feel, the curators are trying to speak to other curators, and not to the public they are employed to serve. The decision to limit the Turner Prize jury to art-world types is another example of this curatorial arrogance. And right now, you can see the same daft impulses ruining Ruin Lust, a pointless collection of different pictures of ruins made over the past 300 years by different artists in different media. No real thematic coherence. No proper sense of development. And a totally silly guiding idea that ruins are “objects of desire”, and that their frequent appearances in art amount to a display of lust. Try telling that to the monk whose monastery was torched or the soldiers whose bunkers were bombed. This is exhibition thinking so thoughtless and awful, it makes the drop of 10% appear fortunate. Curtis has to go. She really does.